We live in an interesting era for DC movies. It’s a time where Batman v Superman and Justice League can fall below expectations, but Aquaman winds up being a ton of fun and Wonder Woman emerges as a contemporary classic. It feels like the best entries in the DCEU are always the ones that have the most going against them. That being said, Shazam isn’t the most well-known DC hero and there’s never been a high demand to see the character on the silver screen. In an unlikely turn of events, though, Shazam! is not only one of the best DC movies, but one of the best modern comic book adaptations, which is saying a lot given how oversaturated the market is with superheroes. Spider-Man might be a teenager behind the mask, but Peter Parker is at least old enough to drive. Billy Batson (Asher Angel) is a mere fourteen years old, although he could teach a college course in street smarts. Billy has been clashing with authority ever since his mother mysteriously disappeared years ago. The young troublemaker is given one last chance with two foster parents who immediately accept him as family, even if Billy is more hesitant. The parents have taken in several other children, including a disabled superhero fanatic named Freddy (Jack Dylan Grazer). Coincidentally, Billy is suddenly swept into the superhero limelight when he’s summoned by a wizard (Djimon Hounsou), who endows his powers to the young chosen one. 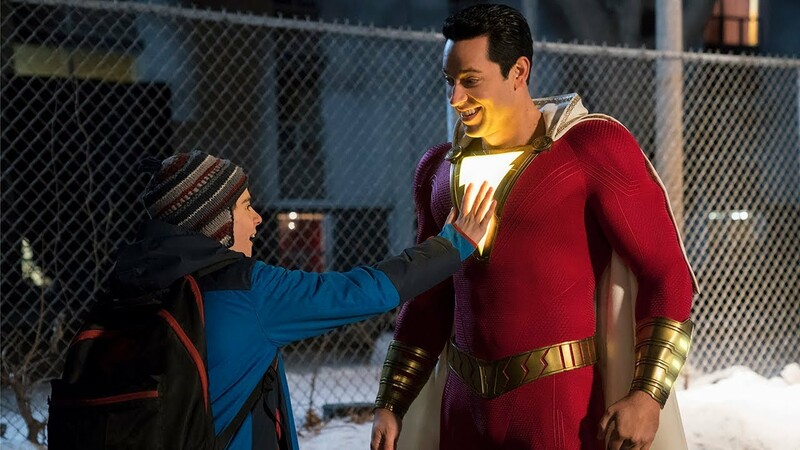 Simply by saying the name “Shazam,” Billy is transformed into an adult Zachary Levi, who comes complete with red spandex and a white cape. Consulting Freddy, Billy does exactly what any kid in this situation would. He makes a series of YouTube videos that put his newfound abilities to the test, resulting in one giant laugh after another. Billy takes full advantage of his more mature appearance as well, purchasing alcohol and talking back to a curmudgeon security guard. Of course, it eventually dawns on Billy that he should probably be using his powers to, you know, fight crime. Once an actual supervillain enters the mix, though, Billy realizes he may be in over his head. DC has owed Mark Strong a great supervillain role even since they pulled the plug on the sequel to 2011’s Green Lantern. Here, Strong kills it as Thaddeus Sivana, a devious doctor who’s been after the wizard’s power for decades. When he becomes a host for the Seven Deadly Sins, Sivana rises up as Shazam’s physical equal, as well as a terrific comedic foil for Levi. Finding just the right balance of menacing and fun, Strong is clearly the actor who should’ve played Lex Luthor in those Zack Snyder movies. As a matter of fact, Sivana’s father is played by John Glover, who previously starred as Lionel Luthor on Smallville. Shazam! is bound to draw comparison to Captain Marvel, which came out less than a month earlier. Billy Batson and Carol Danvers have both gone by the name Captain Marvel in the comics, but that’s not the only thing that links their screen counterparts. Captain Marvel didn’t just take place in 1995, but also had the spirit of a 90s blockbuster like Independence Day, Terminator 2, or Men in Black. Shazam!, meanwhile, feels more like an 80s movie. While the plot sets itself in modern times, Henry Gayden’s screenplay encompasses the same wit as The Goonies, Explorers, and The Monster Squad. The most obvious example would have to be Big, which the film pays homage to during a clever action sequence. Like Tom Hanks before him, Levi never fails to convince the audience that he’s a boy trapped inside a man’s body. Angel is just as effective as young Billy, giving the film its emotional weight. As wacky as Shazam! can get, it still manages to touch upon meaningful themes about responsibility, family, and even abandonment. Without giving too much away, there’s a scene in which Billy finds out what happened to his mother that’s so authentic that it’s actually hard to watch. Like Deadpool or Guardians of the Galaxy, Shazam! isn’t afraid to embrace how outlandish its characters are, but that doesn’t come at the expense of telling an involving story with heart and gravitas. Director David F. Sandberg turned in a pleasant surprise with Annabelle: Creation. With Shazam!, he’s once again gone above and beyond the call of duty. Even if some of the CGI characters admittedly look cheesy, Sandberg has made an otherwise striking picture with inventive action, hilarious dialog, and a winning team of child actors. Shazam may not be a household name, but don’t be shocked if his popularity surpasses Superman’s in the years to come. He not only has the potential to inspire sequels and spinoffs, but to also become the face of the DCEU. This entry was posted in Reviews and tagged Action, Adventure, Comedy, Fantasy on March 23, 2019 by Nick Spake.